As part of the launch event, Google unveiled the CR-48 notebook, which is intended to be a reference platform upon which future devices are based. 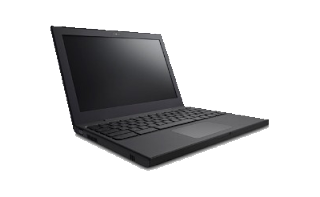 As has been revealed by numerous, lucky recipients of a demo unit, this device is essentially a standard netbook inside with a 12 inch display. The display operates at 1280 X 800 pixels, which is actually a bit lower resolution than a typical 11 inch+ netbook, This particular model also has a standard 1.66GHz Intel Atom N455 single-core processor (although multi-core processors are certainly supported) with standard Intel integrated graphics, 2Gb of RAM, and a 16G Solid State Drive (SSD) from SanDisk. The SSD is a nice addition (something I've always preferred, but have found difficult to find in most netbooks today) which should offer improvements in speed, battery life, and durability (ie no moving parts). The only other marginally remarkable thing about the device is the keyboard, which, while it has a similar layout to any other keyboard, has a number of "custom" keys in places where function keys usually reside. These keys are, in fact, standard function keys, they have just been remapped to serve different purposes in the operating system, such as volume up/down, brightness, etc. Surprisingly, Caps Lock no longer exists - pressing this key brings up a new tab in the Chrome web browser instead. This is a welcome change for me personally, as it means people will have to work a lot harder to shout in their text messages. Finally, both 3G and WiFi access to the InterTubes is included, with free access to Verizon's 3G network for 2 years. There is a 100Mb monthly data allowance, which seems awfully small, in my opinion, for an entirely web-based device. It remains to be seen if this will truly prove to be a problem under normal use. I haven't seen anything that specs out the costs for going over that initial 100Mb - hopefully, Verizon won't use it as an opportunity to gouge users (I'm not holding my breath). That's it, standard netbook fare in a bigger package. For my personal needs, bigger is not what I want - portability is more important to me and smaller is better when it comes to hardware on student desks. But I can understand why the size was increased, as the number one complaint I hear from fogies is, "it's too small". It's also worth noting that there is no mention anywhere of support for accelerated graphics cards. This is somewhat surprising, especially in light of the development of WebGL, which will become increasingly important for gaming in a web-centric environment such as ChromeOS. Software is arguably the most important aspect of any device, as the user experience is almost entirely driven by it. The ChromeOS model is primarily based on the web browser (Google Chrome version 9, in it's current incarnation) and the web - there is no facility for installing any other local applications on the machine. This brings a certain simplicity to the experience, in that there is no other knowledge required to use the device. On first boot, you are asked for three things: your wireless network, your Google account information, and a picture for your account, taken on the built-in webcam (which you can opt-out of, if you so desire). That's it. The next thing that happens is Google's Chrome web browser opens, with convenient "app" icons that give you quick access to Google apps and the Google "Web Store". Since you will already be logged in to your Google account, clicking on any one of these "apps" will take you straight to them without typing in your user id or password again. The idea of "Apps" in ChromeOS can be somewhat dubious. In reality, the majority of these are just links to web sites with pretty icons you can see in the "app" launcher. For the most part (although not in every case) these links point to Chrome specific versions of these web sites. But they are web sites, just the same. The only distinction here from standard web sites are paid "apps", which appear to be based entirely on Chrome extensions. These presumably handle the authentications and authorizations required to ensure that you did indeed pay for them and are allowed to use them. Every one of these "apps" I have tried is based on HTML5 web pages funneled through the extension like a viewer. Obviously, a web browser alone can be somewhat lacking in capability when it comes to managing an entire device experience, so Google has made some interesting additions. Basic settings for the wireless, internet access, the touchpad, and other device specific details have been added to the default Chrome settings window, which can be accessed by menu or by typing "chrome://settings" in the Chrome address bar. The settings are very basic, lending easy access for novice users. There is also an interesting concept of "tabs" or "drawers" across the bottom of the screen, which Chrome utilizes for some applications (like Google Talk) and for basic access to files (which will only be Downloads, since there really aren't any applications that will create local files). These tabs appear as thin, unobtrusive slivers when you are not looking at them, only popping up to show you what they contain when you point at them. Clicking on one slides out the drawer, revealing its contents. The Downloads drawer, which can be accessed any time by pressing ctrl-o on the keyboard, is super basic, offering no real way to create folders or organize what you have downloaded to your device. This may seem like a non-issue, but I can certainly see where this folder might get rather unruly over time, especially with all the attachments I receive via email. I can only assume that Google wants you to re-upload anything you want to keep into Google Docs, as the Downloads tab clearly isn't designed for any sort of long term storage. Notifications for various web apps (like Seesmic) also appear as tabs at the bottom, which I have found to be a quite pleasant, unobtrusive way to be notified. Interestingly, the tabs appear to be independent of the main browser window, as they are available even when you are geeking out in the terminal (more on that later). Printing is one area where the concept really falls flat at the moment. The ONLY way to print is through Google Cloud Print, which is ONLY available for Windows desktops. So, not only will you be tied to a desktop, you will be tied to a crappy desktop. For all you geeks out there, there is plenty of goodness in ChromeOS. As you probably already know, the OS is based on a very slim version of Linux, and a simple "ctrl-alt-t" will get you to a custom shell. Typing "help" in the shell will reveal a number of commands that have clearly been designed for use by technicians who are setting up the devices in complex environments. Simple commands for carrier activation, adding enterprise SSL certificates, and other details can be found here. But the most important command for geeks is the "shell" command, which dumps you out to a standard Linux terminal. Once in the shell, you will find few surprises, if you are familiar with Linux. The directory structure is just what you'd expect - everything appears to be in the right places, unlike Android (which is generally goofy). There isn't a lot to look at - this build is very trim, lacking even common package managers like apt/dpkg or rpm. There are no GNOME or KDE bits anywhere, just a basic X server. The kernel version comes up as 2.6.32.23+drm33.10, which suggests a somewhat modified, but similar kernel to the one that comes with Ubuntu 10.04. The "drm33.10" part suggests that the DRM bits are turned on, presumably in anticipation of future content partnerships (can you say Netflix/Hulu?) Based on the contents of the folders (ie locations of scripts, log files, etc), the kernel version, and the knowledge that Ubuntu 10.04 is required to build it from scratch, it's a good bet that the whole thing is modeled on Ubuntu 10.04 LTS (Lucid Lynx). You'll also find that the home folders are encrypted, which is a good move for a portable device such as this. If it should get lost, private information should be quite secure from prying eyes. Basically what we have is a very trim Linux distribution that boots directly into Chrome, instead of a traditional desktop interface. Nothing fancy or complex, which is exactly the way Google believes most users will want it. The benefits of such a strategy are easy to envision. Delivering applications in this fashion significantly reduces the need for powerful hardware on the users' side, instead relying on the application servers for processing and generation. Lesser hardware requirements reduce size and power consumption, increasing battery life and enabling the creation of smaller and more portable devices at lower cost. Minimal user-side requirements reduce complexity and the likelihood of technical failures and/or vulnerability, naturally increasing reliability. And cloud-based storage enables anywhere, anytime access to user generated data and content, with sharing options that offer opportunities for collaboration and teamwork. The net effect is more choice and increased access for all. Of course, the big question is has the time finally come? With ChromeOS, Google believes that it has. Working with ChromeOS can be at times joyful, and at other times frustrating, The general web experience is just as pleasant as it is with Chrome on a desktop computer: lightning fast, feature-rich, all-in-all quite enjoyable. Chrome Sync is turned on by default, so all your settings, bookmarks, and activity sync nicely with any other device running Chrome. Should anything happen to your ChromeOS device, there is little to worry about because the next time you log in to Chrome on any other device, all (well, almost all - your Downloads will be gone) of your stuff will be there. The system is extremely fast to boot - I clocked 20 seconds on my netbook, the SSD version will probably trim that down a few - and the battery life is quite good, as it is with most netbooks running Linux. The "app"-centric mentality, while a little silly on the surface, I have (unexpectedly) found to add to the overall experience, making using the device more appealing. By utilizing common desktop metaphors and organizational tools, ChromeOS really serves to mask the fact that what we are doing is using the web in the same way that we could on any other device. The addition of Single Sign On (SSO) features in a number of the Chrome-specific sites is a nice touch as well. These sites simply ask you if it's OK to use Google as an authenticator, then automatically get you right to your stuff - no login required. That said, under practical, day-to-day use there are some real pain points. The biggest, by far, is the number of hoops you have to jump through to create anything with content from multiple sources. I don't even think twice about pulling a photo off of my phone or digital camera and adding it to a post or document on a Ubuntu netbook, but with ChromeOS it really causes some heartburn. For one or two one can easily email himself or upload the images to Flickr or Picasa. But any more than a few rapidly becomes an exercise in frustration. Bouncing a photo from one web-based application to another (and then another) just to get it the way you want it can burn a lot of time. In addition, finding webapps to do some of the things one typically does every day can be more than a bit challenging. Once found, those web-based applications, especially the bigger, more complex ones, tend to take a while to load and can be quite sluggish once running. This is only exacerbated when connected to a slower 3G network. Even email attachments become a burden, because there are no built-in viewers for common office file formats. (note the "Unknown file type" message in the tab image above). The best you can do is download the attachments, then re-upload them to Google docs so that you can open and view them. And you don't realize how much you'll miss copy and paste (beyond plain text) between applications until you don't have it. Offline support is also not yet implemented in any of the applications I tried, including the Google apps, essentially bricking the device (which delivers rather humorous "this app is unavailable" messages) when connectivity to the site is lost. This could be a real problem on airplanes and other black holes with spotty connections. Much of this may be resolved in time with extensions and by reworking typical workflows around web-based solutions, but right now it can really feel quite tedious. As such, it's somewhat difficult to imagine a ChromeOS notebook/netbook as more than a casual, ultra-mobile device. It definitely leans more toward the productivity side than an iPad, but only approaches without quite apprehending a more robust operating system on a netbook/laptop. The potential to be much more is certainly there, but the finer points of implementation are yet to be developed. ChromeOS - Will it Succeed? That is the million dollar question. A great deal will depend on the as yet unannounced price, as well as how well Google manages expectations - something that they have not done well in the past, as evidenced by the Nexus One experience. If the device sells for about $200, I think it will be a no-brainer. An inexpensive device that provides an all out, relatively unlimited web experience will be quite appealing to an average user in that price range, especially if Google doesn't over-sell it or its capabilities. If the price approaches $300 and/or Google tries to sell it as the mobile productivity solution, they will likely find it be a lot harder to sell. It's still somewhat justifiable on the merits of the strategy above, but quite a hard sell just the same. But if the price gets close to $400, the backlash will likely be more than even Google can overcome. The experience hardly warrants luxury pricing, and the use case will be extremely difficult to justify vs. any of the vast array of netbooks/small notebooks available for similar/less money. People are generally willing to jump through a few hoops if the cost vs. benefit analysis makes sense, but they are far less likely to do so when they can easily get more for less elsewhere, especially when you consider that a nearly identical experience can be had with the basic Chrome web browser installed on Windows, MacOS, or Linux. Google is cool, but not cool enough to win fanatical lunatics willing to hand over their wallets in exchange for the right to be cool, a la Apple. If the price works out in favor of the end-user, then the only thing left will be execution. Based on what I've seen so far, I believe Google is on the right track. If ever there was a time when a move to to cloud-based computing was more plausible, I don't know of it. The market is ready, the tools are capable, and the developers are on board. All that remains is for Google to provide some leadership, direction, tools, and an open ecosystem that will enable developers to tie it all together to the benefit of all. Thanks for this.They do address the offline issue directly in the video - showing Google Docs and I believe something else working offline, then synching back up when you connect, so I think that will be taken care of shortly (at least for Google-based applications). They pretty clearly state that this is a core functionality that they want it to have.I think folks that use Google-based apps (like Picasa for photo storage) will be okay for combining content from multiple sources, but others will still have those hoops. I think the attachments issue is the bigger one, as the uploading/downloading scenario with Google Apps is still problematic (unless, of course, everyone moves to gmail . . . I see a trend here). Going along with that is dealing with file formats that Google Apps can't edit - there are going to be lots of folks using applications that create docs that simply can't be edited online (at least currently) - this is the discussion we've been having in my district about keeping local servers for a while; while Google Apps can store the docs, that doesn't help so much if you want to actually use a Geometer's Sketchpad document (as an example).